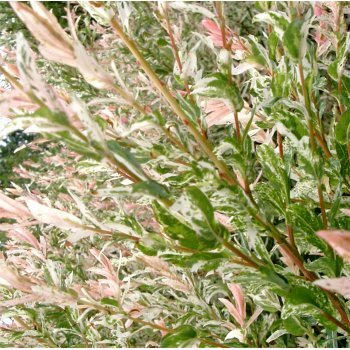 Throughout spring and summer, eye catching pink tipped small leaves sit against a back drop of mottled green and white variegated foliage on Salix integra 'Hakuro-Nishiki'. The Flamingo tree, as it is often known, also boasts yellow catkins that appear on bare orange/brown branches in late winter or early spring. Popular as a patio tree due to it's small size (2.5 x 2.5 metres in 20 years) and bushy lolly pop shape, we think 'Hakuro-Nishiki' looks equally nice planted next to water. It actually prefers a damp site, so a good watering regime is required if patio planting. The branches are pendulous at their tips and can be grown like this or pruned into a neater form; the latter is often preferred when it is grown on a patio. Salix integra 'Hakuro-Nishiki' is a striking variety of dwarf Willow tree that is ideal for when space is limited and it holds the RHS Award of Garden Merit. Our pot grown Flamingo Willow trees can be planted at any time of the year. Start by removing weeds and grass within a metre of your desired planting hole. Dig a square hole as deep as your root mass and approximately 2x as wide. To help the tree establish more effectively, sprinkle root grow in the hole. Remove the pot, gently loosen the roots and place in the planting hole. Mix 50% of the original soil with 50% compost, fill in the hole and firm around gently. Avoid banking the soil up around the collar of the tree. We recommend planting Willow with a stake and tie kit - instructions are in the planting guide. Once planted, keep the area free of competing weeds and grass for the first couple of growing seasons. Rabbits like Willow, so if your areas is prone to rabbits we recommend using a rabbit guard. Once established, you can hard prune Flamingo Willow in winter to neaten the shape and ensure a good flush of pink the following spring. To encourage a clear stem, prune the lower branches in winter. If you prefer a more natural look, leave it unpruned for the first year and then just prune damaged, or diseased branches when required.